This Travel Lite Falcon is the perfect get-a-way trailer providing you with everything you need to explore for as long as you want! 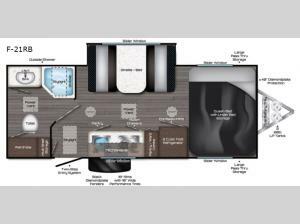 You will love the rear bathroom layout, and single slide out for added interior space. Within the slide out there is a large dinette that converts to a bed. There is additional sleeping space on the front queen bed, plus you'll find convenient under bed storage here. This unit features a two burner cooktop so you can cook dinner like you do at home. The large pass through storage allows you to bring along larger items, while the pantry/wardrobe combo inside can hold food and valuables!